Why a business partnership is like a marriage. How I handled problems with his own partnership. What it’s like to work with a mediator. How to decide if you should start a business partnership. I am back to working full time as of Sep 17th on a new business that I am starting along with a new business partner. I am very excited & happy to be working on something cool :). I will follow up down the road with some thoughts on finding a partner and how we reached decisions around our agreement both the legal and informal. The new business started as a fun project to crunch the last 12 months of calendar data and show people how much of their life they spend in meetings (you can see my meeting profile here). 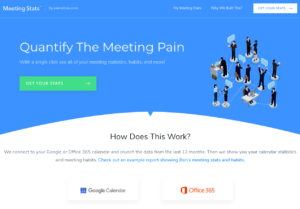 If you want to try it, just go here and it will generate a report on how much of your life is spent in meetings too. The next step is to build out a company version so that a business can gain insight into how much meetings are costing them in time and money. And, we are doing a lot of customer dev interviews to figure out if there is room for a software-driven solution inside some of the problems we are seeing. This really connects me to a big passion I have… which is to see more businesses that are run incredibly well run. Which is part of my much bigger passion to build tools that empower the team to do incredible work and enjoy going to work. There are too many companies stressing out their people and not realizing that is destroying their team and eventually the company.